The day comes every year on January 15. The day of the recognition of valor. The day of the romance of supreme sacrifice for the motherland. On this day, after our independence, Lieutenant General K. M. Cariappa had, as the first Commander-in-Chief of the Indian Army, taken over the charge from the last British commander Sir Francis Butcher, in 1948. In commemoration thereof, the day is being observed as the Army Day. All these years since then, Indian Army has celebrated this day as the symbol of pure love for duty and sacrifice in course of duty. All these years, Indian Army has celebrated this day as the day of pride over martyrdom that has been expanding every year by its valiant members whom life has never appeared more important than duty and discipline. Brave members of Indian Army salute the brave Army Martyrs this day for their valiant patriotism. 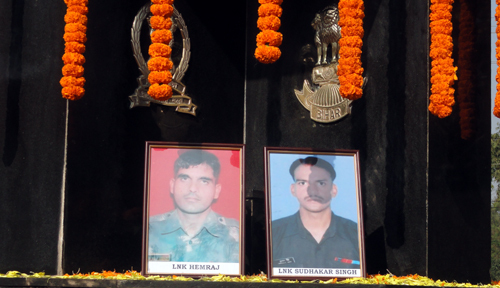 This year, Lance Naik Hemraj and Lance Naik Sudhakar Singh, whose path to martyrdom was paved by bloody infiltrators from Pakistan Army on January 8 in Poonch sector of Jammu and Kashmir, were, as in every Army point in the country, given memorial salutes by the war veterans and incumbent officers at the Amar Jawan War Memorial post in the campus of 120 Infantry Battalion (TA) Bihar, Bhubaneswar. Lieutenant General J. K. Mohanty, PVSM, UYSM, SM, VSM, ADC, the senior most retired officer and ex-Army Commander, Central Command, Lucknow, and Brig B. Routray, AVSM, President War Veteran Officers Association, and Colonel S. K. Padhi, Senior retired TA officer, and Major R. C. Maharana of War Veteran Officers Association, Bhubaneswar as well as	Lieutenant Colonel P. K. Das, Administrative Commandant, Station Headquarters, Bhubaneswar, and Lieutenant Colonel Rajesh Nayak, Officiating Commanding Officer, 120 Infantry Battalion (Territorial Army) Bihar, and Honorary Lieutenant Mahendra Singh, Subedar Major, 120 Infantry Battalion (Territorial Army) Bihar laid wreaths in honor of the martyrs. It may be mentioned that this battalion’s contributions to martyrdom comprise Colonel J P Janu, then Commanding Officer, 120 Infantry Battalion (Territorial Army) Bihar, who had laid down his life during militancy action in 2001 and eight others who sacrificed their lives for Defense of our Nation. In a message of greetings and good wishes to all ranks of the Army, veterans, civilians and their families, the Chief of Army Staff, General Bikram Singh has said, “This day marks yet another year of the Army’s selfless service and commitment to the nation”. “The year gone by is replete with acts of your bravery and unswerving sense of duty. You epitomize the very spirit of secularism, national integration and harmony” he has said. 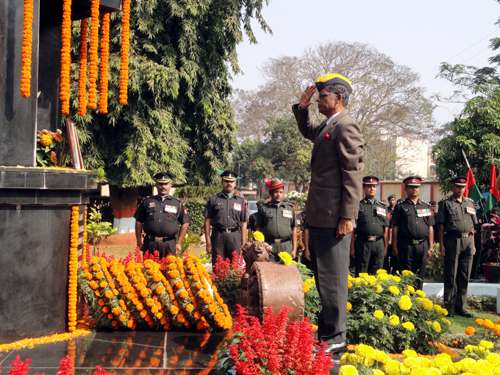 When 2012 was observed as ‘Year of the Veterans’, General Singh has announced that this Millennium has been dedicated to the Veterans “to emphasize our resolve to strive for their betterment”. “There will be many challenges ahead in the year to come. I am sure; we shall surmount these with added zeal, gusto and confidence that have been the hallmark of our great Army. Our efforts to upgrade the Army and make it technologically sound are beginning to bear fruit. 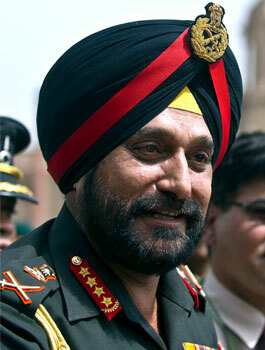 Once completed, these will go a long way in making our Army more vibrant and dynamic”, General Singh has said. 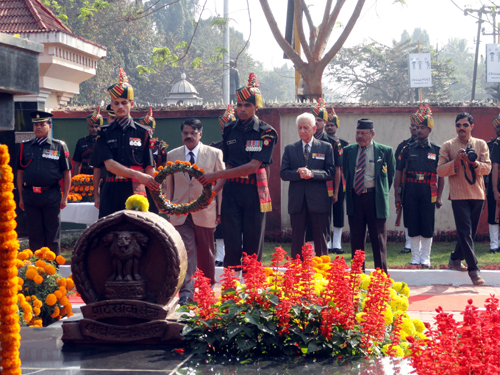 “On behalf of the entire Army fraternity”, says he, “I salute all our comrades in arms, who made the supreme sacrifice in the line of duty and those who sustained grave injuries while upholding the nation’s honor and security”.